When three of us visited Annagassan on Monday afternoon [1 August 2016], we were reminded how this tiny harbour in Co Louth played its role in one of the great romantic weddings of the Edwardian decade. In 1905, Augusta Mary Monica Bellingham of Bellingham Castle married John Crichton-Stuart, 4th Marquis of Bute. The Princess Maud, a steamer, was chartered to take their guests across the Irish Sea to Bellingham Castle for the wedding, and the wedding party arrived and left through the harbour at Annagassan. We decided to find out more about the Bellingham family and Bellingham Castle, and moved on to the neighbouring village of Castlebellingham, where we found a wedding was taking place on Monday afternoon in the Bellingham Castle Hotel. In recent years, Bellingham Castle has been transformed into a romantic wedding venue, with 19 luxury bedrooms and the appropriately-named sumptuous Bute Suite, which recalls that society wedding over a century ago. Bellingham Castle, or Castlebellingham House, stands on the site of an earlier medieval castle, and has been the ancestral home of the Bellingham family since the 17th century. Henry Bellingham, who bought the estate in 1660, was a junior army officer during the civil war. He bought the lands of Gernonstowne, Co Louth, from a fellow soldier who had been granted them in lieu of arrears of pay, and the purchase was confirmed by King Charles II. The Bellingham family takes its name from Bellingham, a village in Northumberland, north-east of Newcastle upon Tyne. Sir Edward Bellingham (1506-1549) was Lord Deputy of Ireland in 1548-1549. This branch of the family came to Ireland with Henry Bellingham in the 1650s, although the village was not known as Castlebellingham for at least 40 years after the lands in Co Louth were bought by the family. The castle was occupied by Jacobite troops and burned down in the autumn of 1689 by James II in a revenge attack. Colonel Thomas Bellingham was a guide for William III before the Battle of the Boyne, and it is said King William’s armies camped in the grounds of the castle on the night before the Battle of the Boyne. Three years later, Thomas Bellingham planted a royal oak on a mound close to the castle gates in 1693. When it was blown down in 1902, a wayside cross was made from its wood, and since then another tree has been planted on the mound. Bellingham Castle is a detached, multiple-bay two-storey over-basement former country house, built in 1712. The house was completely remodelled 1798, when a third storey was added, and ca 1820, when it took the shape we see today with its crenellated parapet, turrets and towers. The Gothic embellishments, which are echoed in the entrance gates, can be seen on every elevation. The little details, such as the gargoyled boss to the base of a turret on the east elevation and the decorative label stops on the hood mouldings of some windows, help to create an interesting contrast to the Georgian classical windows on the main elevations. The double pile main block has principal east (entrance front) and west (garden front) elevations on the long sides, and a single-storey wing to north. The crenelated parapets and turrets were added ca 1820, and there are square corner turrets, an octagonal bartizan, a crenellated entrance porch with octagonal corner turrets, two three-storey buttressed bows, a square turreted crenelated tower and parapets that hide the shallow pitched roofs. The bartizan to the east elevation has a painted stone gargoyle boss, there are wrought-iron balconettes, a tower with painted stone mullions, panelled doors, and stone traceried fanlights. The house played a central part in the development of the village to which it gives its name. Much of the village is occupied by estate houses and in previous generations many of their residents worked on the estate in its heyday. However, the name Castlebellingham does not appear on any documents until about 1710. Over time Castlebellingham became an important place in Co Louth. Fairs were held every year, a church was built beside the castle, and with it came a graveyard that included the Bellingham family vault. The Bellinghams became one of the most powerful and influential family in Co Louth, and for over 100 years (1660-1775), without interruption, a Bellingham sat in the Irish Parliament as an MP for Co Louth. A brewery was built near the castle around 1770 by O’Bryen Bellingham. However, the main brewery in the village was founded half a century later by Captain John Woolsey. His mother was a Bellingham and the family was closely related to the Cairnes brewing family and the Jameson distillers. The brewery in Castlebellingham, once employed about 70 people and was the main supplier of beer to the troops during the Boer War. The brewery is still remembered in the name of the Brewery Tavern, Brewery Road and the Malthouse Apartments. The first of the Bellingham baronets was Sir William Bellingham (1756-1826), the fourth and youngest son of Colonel Alan Bellingham and Alice Montgomery, daughter of the Revd Hans Montgomery of Grey Abbey House, Co Down. His elder brother, O’Bryen Bellingham, stayed at home and founded the first brewery in Castlebellingham. Sir William Bellingham was baptised in Saint Peter’s, Drogheda, in 1756. As the fourth and youngest son, he could not have expected to inherit any estates in Ireland, and after graduating from Trinity College Dublin in 1778, he moved to England where he carved out a successful career in politics. In 1783, he married Hester Frances Cholmondeley (1763-1844), daughter of the Revd Robert Cholmondeley and granddaughter of George Cholmondeley, 3rd Earl of Cholmondeley. From 1784 to 1789 he was MP for Reigate, Surrey. As a commissioner for the Royal Navy, he oversaw the provisioning of George Vancouver’s expedition along the West Coast of North America. Although he never saw the Pacific Ocean, Bellingham Bay in Vancouver and the city of Bellingham, Washington, were named in his honour. He became the private secretary of William Pitt (1759-1806), Britain’s youngest ever Prime Minister (1783-1801 and 1804-1806), and was made a baronet in 1796, with the designation of Castle Bellingham. North of the castle, beside the church and churchyard, ‘The Widows Houses’ were built by Sir William around 1826 as a charitable foundation to house the widows of former estate workers. The houses may have been designed by William Vitruvius Morrison (1794-1838). They were four self-contained units, each with one ground-floor room and one first-floor room in a half-dormer attic. They show have high quality design and craftsmanship, with Gothic windows, lattice glazing, decorative bargeboards and finials. There are decorative modillions, a religious Della Robbia-revival plaque and a carved inscription that reads: “John III.16, John XIV. 6, Acts IV.12”. 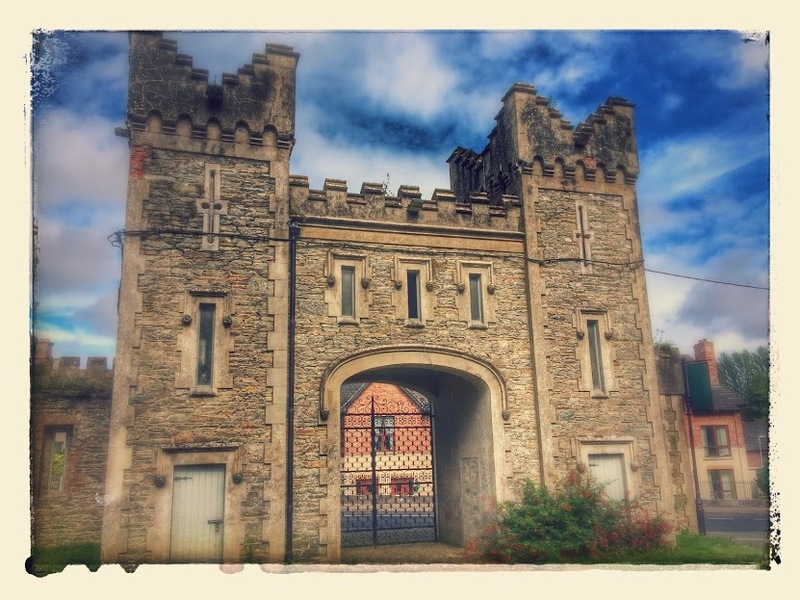 This is a unique and valuable part of the architectural heritage of Co Louth. The entire building was sold earlier this year, and I wonder about its future. When Sir William died in Beckenham, Kent, in 1826, his body was brought back to Castlebellingham and he was buried in the family vault in Kilsaran. The title then passed to his nephew, Sir Alan Bellingham (1776-1827), as second baronet. Sir Alan was the son-in-law of a Church of England priest, the Revd Rees Edward Walls. By 1824, before he ever inherited the title, Alan Bellingham had run into financial difficulties and leaving his family in Ireland, he fled his debtors to France, taking up residence at Châtillon-sur-Loire. He inherited the title in 1826, but he died in financial exile in France a year later at the age of 51 in 1827, and the castle, estates and title passed to his eldest son Sir Alan Bellingham (1800-1889), the third baronet. During his time, Saint Mary’s, the Church of Ireland parish church, was built by the castle gates in 1852 to replace the older parish church for Kilsaran. The church stands on an elevated site opposite the former village green. This is a cruciform church with a three-bay nave, north and south transepts, a chancel to the east, and a square two-stage tower. The church was designed by Welland and Gillespie and shows high quality craftsmanship, with carved stone details on the buttresses, door and window surrounds and elegant stained glass windows. Sir Alan’s youngest brother, Sydney Robert Bellingham (1808-1900), who was the fourth son and only 15 years old, left for Canada alone to seek his fortune. There he became a successful businessman, lawyer, journalist, and military and political figure. In 1878, he returned to Ireland and to Castlebellingham, which he had inherited in 1874 after the deaths of his elder brothers. Sydney Bellingham and his wife Arabella lived at Southgate House, Castlebellingham, where he died in 1900, without children. One of the decorated windows on a house in the village is inscribed ‘SB, 1808-1896’ in his memory. In his will, he left the Castlebellingham estate to his nephew, Sir Henry Bellingham, the fourth baronet. The fourth baronet, Sir (Alan) Henry Bellingham (1846-1921), was born at Dunany House, Castlebellingham, was educated at Harrow and Exeter College, Oxford, where he graduated BA (1869) and MA (1872), and in 1875 he was called to the bar by Lincoln’s Inn. Two years earlier, while he was still in his 20s, Henry Bellingham made a very public conversion to Roman Catholicism in 1873, and became a friend of Cardinal Newman and Cardinal Manning. A year later, in 1874, he married Lady Constance Julia Eleanor Georgiana Noel, a daughter of Charles Noel, 2nd Earl of Gainsborough, in the private estate chapel in Exton Hall. Her father was a prominent Whig politician who embraced Roman Catholicism in a very public conversion in 1850; her mother was a first cousin once removed of Queen Victoria and one of her bridesmaids; and her grandmother, Elizabeth FitzClarence was an illegitimate daughter of King William IV. Her sister, Lady Blanche Noel, caused a society scandal when she married Thomas Murphy, the Irish-born organist in their father’s private chapel. In 1889, Henry Bellingham succeeded to the family title; two years later, his wife Lady Constance died in 1891. In 1895, Sir Henry married his second wife, another prominent English Roman Catholic, Lelgarde Harry Florence Clifton, younger daughter of Augustus Wykeham Clifton and his wife Bertha Clifton, 22nd Baroness Grey de Ruthyn. Sir Henry was prominent in political life in Co Louth. He was a Conservative Home Rule MP for Co Louth (1880-1885) until the constituency was abolished. He was a Justice of the Peace, High Sheriff of Co Louth in 1897 and a Deputy Lieutenant for the country. In 1900, he inherited the Castlebellingham estate from his uncle, Sydney Robert Bellingham. He was appointed Lord Lieutenant of Co Louth in 1911, an office he held until his death in 1921. Bellingham was a keen supporter of Irish language movements, a Commissioner of National Education for Ireland, a Senator of the Royal University of Ireland, and in 1909 received an honorary doctorate from the RUI, later the National University of Ireland. As a prominent Roman Catholic, he became a Private Chamberlain to three successive popes, Pius IX, Leo XIII and Pius X. He set out the circumstances that led to his conversion in a small publication in 1914, Reminiscences of an Irish Convert. He was also the author of a work on Social Aspects: Catholicism v. Protestantism, and articles in the Dublin Review. who have also fallen asleep in Christ. Pie Jesu Domine dona eis requiem. Sir Henry was also responsible for a collection of inset religious panels that can be seen on the upper façades of many of the village buildings. These are also a reflection of Sir Henry’s religious sentiments, and they are unique in Ireland. In addition to the many panels, there are biblical quotations cut into the stone window sills of some buildings. In 1905, his younger daughter, Augusta, married John Crichton-Stuart, 4th Marquess of Bute, in the society wedding that brought world attention to Bellingham Castle, and the guests were brought on board a chartered steamer that sailed into Annagassan Harbour. His elder daughter, Mother Mary Emanuel (Ida Bellingham), was a nun in the Holy Child Order at Saint Leonard’s-on-Sea. His sister was the mother of Sir Evelyn Wrench (1882-1966), editor of The Spectator and founder of the English Speaking Union. His nephew, Benjamin Plunket (1870-1947) was Bishop of Meath (1919-1925). In 1905, Bellingham Castle was the venue for the romantic wedding celebrations of Sir Henry’s daughter, Augusta Mary Monica Bellingham, and John Crichton-Stuart, 4th Marquis of Bute and one of the wealthiest men in these isles at the time. No expense was spared as the guests were entertained to a lavish celebration. A steamer, the Princess Maud, was chartered to take the guests and the Isle of Bute pipe band across the Irish Sea to Annagassan Harbour and on to Bellingham Castle. As the society event of the year if not the decade, the wedding attracted the world’s media attention, from California to New Zealand. The surviving footage from the wedding is believed to be the one of the earliest wedding films in the world. Bellingham Castle is seen clearly and there are scenes of Kilsaran Church and of Annagassan. The wedding party and guests departed as they had arrived, by steamer from Annagassan Harbour. But as they left the tiny harbour on the Co Louth coast, the world they left behind in Ireland was about to fall asunder within a decade, with the outbreak of World War I and the unfolding of the events that led to the Battle of the Somme and the Easter Rising in 1916. But more about that and the last Bellingham baronets at Castlebellingham tomorrow.